That's according to the latest planning application, which although not explicitly stated, will see the northern island taken out of use. I expect most East London Line trains will use platform 5, as getting out of platform 3 means crossing the other line. I've marked the locations of the planned lifts as black squares, but I don't understand them. The one on the 3/4 island gets you to half way up the station's stairs, which is useless, and the one on the 5/6 island gets you to nowhere. As for what's happening at the other new terminus, West Croydon, they're just putting in a siding beyond the station. If they want to get cunning at Crystal Palace, ELL trains could use platform 5 in the mornings and 3 in the evenings to optimise cross platform interchanges at busy times. 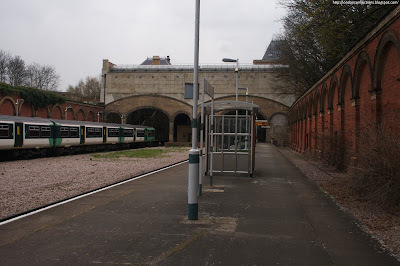 Does the lift that only reaches the half landing line up with the footbridge over the other platforms on the other side of the wall? Not sure i get the plans you have there. So if I get the East London Line in from Newcross and want to go to victoria direction i can't just cross the platform ? Travers: If the train terminates in platform 5, no. If it terminates in platform 3, yes. Not remotely convinced by this as usual. Grafting two over-complex relatively infrequent services on top of each other is not a good recipe for reliable operation, or appeal to the general public. 1) Scrap the current Overground services proposal, 4tph each to West Croydon, Crystal Palace, New Cross and Clapham Junction. Four-branch metros do not run reliably. Instead run 6tph to Crystal Palace, Clapham Junction and New Cross. The branches will get a better service which will be easier to run reliably, and they will fit better with the current 6tph from London Bridge to Sydenham. 2) Abandon Southern through trains from Sydenham to Crystal Palace, instead run 6tph London Bridge to West Croydon via Sydenham. Outcome: proper reliable tube-like frequencies on all services concerned, and easy same-platform interchanges between Honor Oak/Sydenham for north and southbound destinations. Less potential confusion at Crystal Palace for people trying to decide which platform they need to catch a train. Lovely photos. 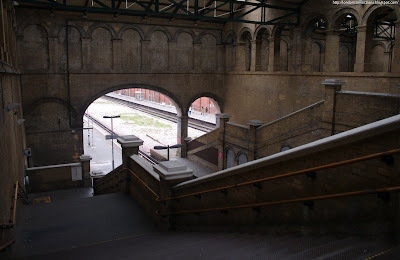 I really think Crystal Palace is one of the most beautiful (albeit a shadow of its former self) stations in London. Isn't the Croydon tram being extended to Crystal Palace station? "Four-branch metros do not run reliably." Really Max? I think the SNCF might be upset (and quite surprised) to hear that their Paris RER lines are unreliable. And I seem to recall Friend Hendy pointing to some at least fairly reliable operation on the Northern line of late? I agree with Max that you really need a minimum frequency of 6 tph for a proper turn up and go metro where you don't need to bother about looking up the timetable. But he is cheating a bit because his proposals increase the service on the core section from 16 to 18 tph. re: Tramlink. See the diagram in this old post. It doesn't actually go into the station. There is a line in that NLL '24 hour timetable' document, (on the ORR website), that refers to extra ELL ECS moves due to the extension to Highbury, and the 'additional peak services to Crystal Palace'. Perhaps that explains the second bay? RER Line C is notoriously unreliable, ask any Parisian. In fact, I've never got to travel on RER C because whenever I have tried there has been service problems and no trains turning up. The other RER lines are no more than three-branched. But these are middle/outer suburban routes. You could have cited Waterloo commuter services (how many branches?) but the individual lines such as Hampton Court and Chessington don't get many trains. But at the end of the day, why create a chronic day to day management problem of keeping a four-branched network running reliably? How exactly are users going to benefit? How many people are actually intending to sit on a train at West Croydon and travel all the way to Dalston? I bet you it would be quicker (after upgrading) to get Thameslink from East Croydon to Kings Cross, then Victoria Line and NLL! ELLX is actually even worse because its branches are going to have unbalanced demand. Differential loading of trains makes it harder to run the services at even intervals on the core sections. Popular trains will run slower than less popular trains, and so be caught up by them. Take the point about 18tph versus 16tph, but as I am cutting 4tph back from West Croydon, it would be interesting to compare the mileage. If the predominant cross flow is going to be passengers from Gipsy Hill and points west changing at Crystal Palace in the morning and the reverse in the evening - Would it not be best to keep the northern bay(for the shorter morning peak only)and then flip the middle stabling bay to the north side of the centre platform road thereby making cross platform interchange easier in both directions at peak periods. Would filling in the southern bay platform make access any easier to the Norwood Junction/ Birkbeck/ Beckenham platforms? I don't know why this has never been thought of as part of overall the London Overground plan, but there's an easy way that the London Overground could be made truly orbital, by allowing WLL trains to use platforms 16 and 17 at Clapham Junction and then proceeding down through Balham, Streatham Hill, West Norwood, Gypsy Hill and finally reaching Crystal Palace, where they can join the ELL. Another point for Max to take into account, don't the stopping services from West Croydon via Sydenham transfer to Thameslink anyway? Being a Parisian myself I tend to agree with Max. The RER lines B, C (though on the latter it changed in the last few years due to increased slack time and the eradication of rolling stock from the sixties) and more notoriously the line D (less than 75% of trains on time !) are unreliable. I don't think that's the many branches that causes all the delays though, as the other RER lines are running quite neatly. It's more a mix of constant vandalism, bottlenecks because rail tracks are shared by many trains (TGVs, RERs, regional trains, etc.) and outdated infrastructure. True point anonymous, and the thameslink services are grouped into 4tph patterns too. So how many different services will there be on the NGX-Sydenham section? ELLX, Thameslink. Will there be any Southern to LB & Victoria? At this rate it will end up with better frequencies than some sections of the tube! There won't be many other Southerns out of LB other than the ones via Tulse Hill and the Uckfields, Tattenham/Caterhams, LB-Crystal Palace-Victoria and LB-Beckenham Jn? AIUI all others will run out of Victoria. I see from the RUS that changes have been made to to the the BML LB-Tonbridge, the Horsham-Redhill-Tonbridge and the Strood-Paddock Wood bits. I can't work out what the changes mean though! as i understand it the limited Southeastern service from Tonbridge to Redhill and then up the BML to London Bridge will be terminated (often run by class 508s). the Southeastern service from Tonbridge to Redhill (often starting form Paddock Wood or even Strood) and often continuing down to Gatwick or Horsham will be stopped and Southern will take over the line (not sure how/where they are running the branch lines trains to and from). Juging by this plan, it's blooming daft - if I want to get a departing Overground train from Crystal Palace, I will have to run backwards and forwards between platforms 3 and 5 hoping to get the right train instead of just being able to wait on one island platform. The platform info monitors will break and they'll keep changing departure platform - they're reinventing the craziness of Edgware Road (circle line)!